Pink Beaches In Lombok | The blue sky and the sea water and clear white sand framed may have become a common sight when visiting the beach. So what if the natural beauty of the beach sand beach framed by pink? Of course this is not unusual. This is one of the beauty that can be found in the Komodo National Park, East Nusa Tenggara. Pink Beach or Red Beach is one of only 7 pink sandy beaches in the world. Not only beautiful state beaches, underwater life at the Pink Beach also save the beauty and richness of interest to dive. Pink Beach underwater park is home to various species of fish, hundreds of species of coral rock, and various other types of marine life. Therefore, snorkeling or diving is an activity that should not be missed when visiting this beautiful beach. Pink Beach is another attraction of Komodo National Park which has been crowned one of the seven natural wonders of the nominations in the world. Named Pink Beach because the beach sand is pink (pink). 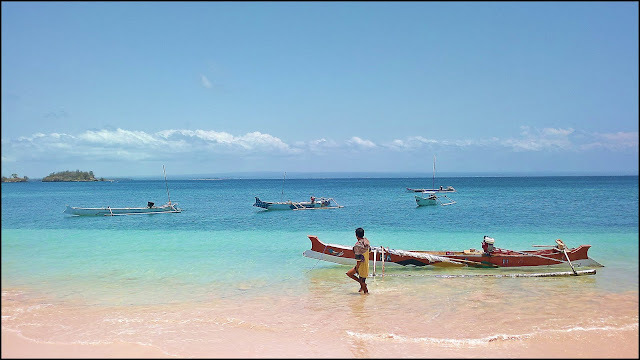 Local people prefer to call it the Red Beach, while foreign travelers prefer to call it the Pink Beach. Soft pink color seems increasingly obvious, especially when the waves swept away the sand. It is not certain what is the origin of pink sand color is beautiful. Some argue that the pink color comes from red coral fragments that are already dead and is commonly found on this beach. Another opinion says the color pink on Pink Sand Beach is due to the presence of microscopic animals called foraminifera that produce red or pink light on the reef. In the world, the type of beach with pink sand, there are only seven only. The other six are the Pink Beach in Harbor Island, Bahamas; Bermuda; Santa Cruz Island, Philippines; Sardinia, Italy; Bonaire, Dutch Caribbean Island; and in Balos Lagoon, Crete, Greece. 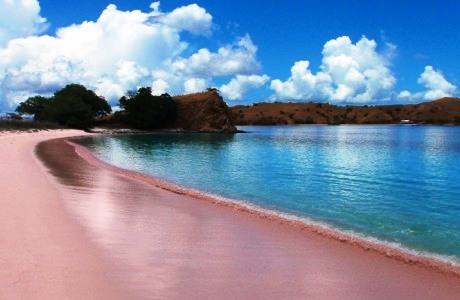 How rich and beautiful nature of Indonesia; one in seven pink sand beaches can be found in this country. Uninhabited beaches and deserted can be reached by renting a boat or speed boat from Labuan Bajo. Usually travel tour package will take you to the island of Rinca and Komodo Island then to first. From Labuan Bajo Pier towards Loh Buaya on Rinca Island takes approximately 45 minutes. On the islands you can see it is a worldwide direct dragons in their natural habitat by choosing a particular trekking route. For more details, please read the Walkaround. From Pier Loh Liang, a dock on the island of Komodo, it takes approximately 30 minutes away by boat to set foot in pink Beach, beach sand color is unusual. If you are interested in trekking through the coral cliffs and mangrove forests, it takes approximately 4 hours on foot before finally arriving at the Pink Beach. Labuan Bajo there are also ships LOB (Live Aboard) are usually hired by divers which can also function as a place to stay during the search charm Flores. This ship can also be your transportation options. To reach Labuan Bajo, there are flights from Denpasar to small aircraft Fokker similar to the Komodo Airport for approximately 1 hour. From the airport to the port of Labuan Bajo takes approximately 10-15 minutes drive. You can hire a car to get to the port. Natural conditions are still clean natural charm presenting awesome. Hill extends from the end of the beach to the other end as if keeping this beach. Conditions of deserted beaches and uninhabited give the impression of exclusivity for anyone who comes. on a gorgeous and exotic relaxation activities certainly a lot of fun and interesting thing to do. The former can certainly enjoy the natural beauty of pink sandy beaches that He wants them to fall into Indonesia's easternmost region. The beauty of the pink sandy beach is also equipped with a panoramic beauty of the surrounding nature. Green hills looked elegant set in sky blue decorated with white clouds super clean. Small islands are visible from this beach also complement the beauty of the Pink Beach. Color turquoise sea water is very clear and uncover the beauty of the marine park is also not to be missed. Even the rocks in the shallows can be seen with the naked eye from the ship. Well, snorkeling and diving has become a sort of compulsory activities while visiting this beach. Condition of the underwater park is still pretty awake, not much damage. There are many colorful biodiversity: thousands of species of fish, hundreds of species of coral reefs either soft or hard, and so forth. Snorkeling near the shoreline alone will indulge your senses, especially when diving deeper. Make sure you bring a snorkel or diving when it comes to this beautiful beach. There are many tools rental snorkeling and diving in Labuan Bajo, or you can ask your travel agent or guide you. 2 Responses to "KEINDAHAN WISATA PANTAI PINK DI LOMBOK TIMUR PINK BEACH"
Hi there, where is the sea bungalow resort in the pictures?